We keep hearing how there is a big difference between Jew hatred and anti-Zionism. Those who are promoting boycotts of Israeli goods, academics, athletes, etc. until Israel provides ‘justice’ to Palestinian Arabs — which is defined in terms that would preclude the existence of the Jewish state — vehemently insist that they have no problem with Jews per se. Often they themselves are Jews. “How can we be Jew-haters,” they ask? This position is belied by their double standards and by the pathological obsessiveness of their focus on Israel. But they nevertheless maintain that the logical distinction between hating Jews and ‘opposing’ (in fact, hating) Israel on behalf of the Palestinian Arabs means that social sanctions against antisemitism (and in some countries, legal ones) do not apply to them. But if we look at the Palestinian movement that they are supporting, it is joined at the hip with ideas and people that represent classical racist Jew hatred of the most murderous kind. We can quickly dispose of Hamas, whose charter — which has not changed since its inception — contains anti-Jewish material taken directly from the Protocols of the Elders of Zion. But did you know that the Palestinian Authority (PA) published a textbook for children in 2004 that asserts that the forged Protocols are historically true? The PA media and religious appointees also continue to describe Jews as descendants of apes and pigs. Does this count as ‘criticism of Israeli policies’? We know that the first ‘Palestinian’ leader, Haj Amin al-Husseini, fomented pogroms against Jews in Palestine in the 1920’s and in Iraq in 1941. Then he went to Germany and helped Hitler raise a Bosnian Muslim SS division to fight in Eastern Europe. After the war he helped clandestine networks resettle wanted Nazi war criminals in Arab countries (Egypt and Syria), where some served as military or political advisers. Both Yasser Arafat and Mahmoud Abbas praised him as a Palestinian hero. It’s well-known that Mahmoud Abbas wrote a ‘doctoral’ dissertation (see also here) in which he claimed that there were fewer than 900,000 Jewish Holocaust victims, that the Nazis did not murder Jews in gas chambers, and that Zionists encouraged Hitler to murder Jews in order to gain the world’s sympathy! It’s also documented that Abbas, working under the direction of Arafat, provided funds to terrorist Abu Daoud to carry out the massacre of Israeli athletes and coaches at the Munich Olympics 40 years ago this September. Berlin – Newly released files from Germany’s domestic intelligence agency reveal that neo-Nazis plotted with the Palestinian group Black September in the 1972 Munich Olympic terror attack that killed 11 Israeli athletes, according to a Der Spiegel magazine story on Sunday. According to the online Spiegel report, police in the city of Dortmund sent a notice to the German domestic intelligence agency, Verfassungsschutz (BfV), in which “Saad Walli, an ‘Arab looking man’ met conspiratorially with the German neo-Nazi Willi Pohl.” The meeting took place roughly seven weeks before the 1972 terror attack in Munich. Pohl, the neo-Nazi, is now a crime fiction author and said, “I chauffeured Abu Daoud throughout the entire Federal Republic where he met in different cities with Palestinians.” Pohl helped Daoud obtain false passports and other documents, according to the report. The Palestinian movement, both the Islamic and nationalist branches, has always worked hand-in-glove with its natural allies, the Nazis and neo-Nazis. It emphasizes anti-Jewish doctrines in Islam, and promulgates the long-discredited myths of European antisemitism. If you support the Palestinian movement and its goals of replacing Israel with an Arab state — even if you hide behind the fantasy of a ‘democratic state of all its citizens’ — you need to understand exactly who you are supporting and what you have signed up for. 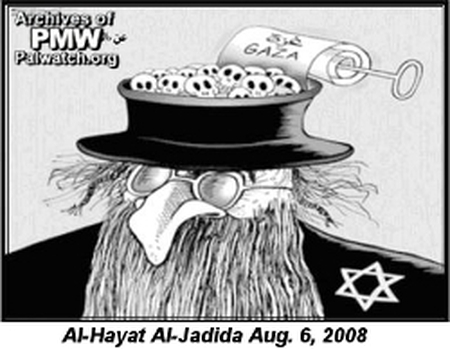 This entry was posted on Sunday, June 17th, 2012 at 11:34 am and is filed under Antisemitism. You can follow any responses to this entry through the RSS 2.0 feed. Both comments and pings are currently closed. Well-stated, as usual. The Palestinians are a current day extension of the Nazis of the third reich. It is worth noting here that the EU’s working definition of anti-Semitism includes subjecting Israeli policies or behavior to a pejorative standard unique to Israel. Just to make sure people understand this, most EU countries then go on to demonstrate this repeatedly…. My point is that people in responsible positions, even in Europe, know very well what is going on. But with rare exceptions, they do nothing to stop it. This may be out of cowardice, because they have been bribed, or because they really are anti-Semites themselves and for this reason, are happy to “pile on” with the Arab/Moslem Jew haters. Or some combination thereof. It has been said in many quarters, in different contexts, that Obama wants the U.S. to be “more like Europe”. He made this plain early in his administration on some of his “apology tours”. It should be noted that his behavior towards Israel is also very much in line with many EU states; his emulation of the European world view includes this aspect for sure. In some previous recent columns, Vic, either you or Barry Rubin, whom you were quoting at length in a couple of installments, made the statement that it would be “an exaggeration” to say that Obama “hated” Israel or “wanted Israel destroyed”. That was the only disagreement I had with those otherwise excellent columns, both yours and Rubin’s. No, I emphatically disagree. Obama DOES hate Israel, and he DOES want them destroyed. Let’s not kid ourselves about this. Not that I think he means to do the job himself. His role is to create the conditions that will lead to Israel’s ultimate dissolution as a Jewish state. Along with most of Europe, Russia, and the UN, he intends to shove a Saudi-style “peace plan” down Israel’s throat, and in so doing, put a PA state within easy rocket and mortar range of Israel’s most important population and industrial centers. You yourself wrote a column a few years ago about what this grim “Ghost of Hannukah Future” would look like, though it was within the context of Israel under the shadow of a nuclear Iran. At that time I responded, and maintain today, that the future vision you painted was also precisely what would happen if even the “moderate” Fatah PA under Abbas got what it wanted. If the most important centers of Israel wind up facing what those who live in Sderot face today, and if a world community as led by the likes of a U.S. president such as Obama make it all but impossible for Israel to defend herself without being sanctioned as a pariah state, many Jewish Israelis will leave, foreign trade and investment will dry up, and it will be all but inevitable that Israel will suffer the same fate as Rhodesia during the 70s. The rocket fire and terrorism will only end when Israel agrees to become a non-Jewish, “binational” state and effectively, another Arab state. Kofi Annan – or maybe it was Boutros Boutros Ghali, I forget which – once said that was the only way there would ever be peace. This would all play out, at least the final acts, after Obama would be out of office, safely ensconsed in his academia sinecure with perhaps his second Nobel Prize hanging on his wall, and his Swiss bank account stuffed with petrodollars for his “services”. Or maybe it would happen over the course of his second term. He wouldn’t care. He wouldn’t be up for re-election anyway. I don’t see things necessarily turning out that way even if Obama is re-elected, but that is clearly what he intends to do. Israel had better deal with Iran’s nuke program while she can, as that threat represents the most powerful leverage Obama has to see his plan to fruition. If that is taken away, he can huff and puff all he wants, but if he leans too hard on Israel, with Iran taken care of, I see Israel simply being pushed into China’s arms at the expense of the U.S. That is a risky scenario itself, however, for other reasons. It is not a sure way out. We cannot afford another four years of Obama. The Palestinian Arab effort to demonize Israel works in many areas and on many different levels. The whole Middle Eastern studies takeover in the U.S. is a manifestation of it. Here however it should be pointed out that the Palestinians are aided and abetted by various Arab and Islamic allies, including in this particular case, the Saudis. Incidents in which Israel are displayed in an unfair light abound in the media. This is very commonplace. The Palestinians have most especially used the whole ‘occupation narrative’ to make Israel seem a demonic oppressor. I would just like to make a small reply to Robman who outlines a scenario in which Israel is undermined by the Obama regime pushing for a Palestinian state. As I look at it, and this is pure speculation a more likely at the present source of undermining is precisely through Obama’s doing what many of us want him to do i.e. make a preemptive series of strikes against Iran. My concern is for massive damage that will be caused to Israel by missiles of retaliation we have no real defensive answer to. But of course that is only my anxiety talking and mere speculation. And it may be that the preemptive strike really is the right action. But it is for far more knowledgable than me to really understand the right action in this matter from Israel’s point- of- view. I also don’t pretend to know precisely how Israel should deal with the Iranian nuclear (and non-nuclear, via Hizballah or Syria) threat. 2) If war is inevitable, then it should be war on our terms, not theirs. Of course knowing when war is inevitable is the trick.